And the winner chosen by random.org is...Katrina. Please contact me and I'll give you further details about claiming your prize. Thank you to everyone for participating. Here's your chance at something fun! 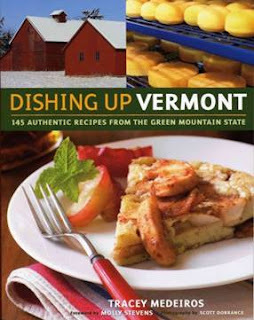 The famous Murray's Cheese Shop in the West Village is hosting a great event, featuring a new cookbook called Dishing Up Vermont by Tracey Medeiros. Whenever I think of Vermont (and it's been in my thoughts recently, given that I was just there last weekend), I think of wholesome, natural food made of quality ingredients, using sustainable methods. Tracey's cookbook features that and more, giving much needed kudos to Vermont's farmers, chefs and food producers who practice sustainability. You'll be able to meet Tracey at the event, get her to sign your book and chat her up about what tickles your tastebuds. Below are the deets about the event, which includes a glass of wine as well as a tasting of one of her recipes. Thursday, April 8th from 6:30 p.m. - 8:00 p.m.
One lucky Foodista reader will also have the chance to WIN FREE admission to the event, including your own complimentary copy of the book. How to Enter: Simply comment on this blog and tell me what your favorite cheese is. The winner will be selected at random by random.org. Entries must be submitted by Wednesday, March 10th, 2010 by 12:00 a.m.
Good luck and enjoy! I'll notify the winner individually by email. While a part of me feels that I should name a unique cheese, my love of Italian Cooking demands that I name Parmeseano-Reggiano. Love your blog! Favorite cheese...hmm, so many to choose from... i can never pass up an aged gouda! Hi, my favorite cheese are hard, sharp cheeses, like a well-aged Gouda. Murrays has a cheese similar to that called "Roomano" which I really like! I absolutely adore Pecorino Tartufello. It's the most amazing cheese! I am perpetually in love with a cheese called Coolea, a cow's milk cheese from Ireland. It's like eating a rich, buttery cheddar, with those awesome little crystals here and there. It's seriously delicious. I got it at the Bedford Cheese Shop last time. I love all types of cheese! From cheddar, fresh mozzerella, feta etc.! At this time my favorite cheese is brie cheese. I love the buttery taste from it! Dubliner Irish Cheddar. mmmmmm. Sharp, sweet; it's basically crack. I once drove all the way to Montreal just to eat and buy goat cheeses. There was one that had an edge as sharp as the sound of chalk scratching a blackboard, but which tasted like butter. I didn't note the name and have never had it again. Bobolink at the USQ Greenmarket has a cheese from the end of the growing season called "last chance" with a real edge to it, too. Tie: I'm originally from DC, and when I feel homesick for Cowgirl Creamery, I crave their award-winning Red Hawk. But lately I've been super satisfied with all of the feta varieties available in Astoria, where I live now. Runny, stinky, amazing Gorgonzola is always my favorite. Second runner up is the imported Parmesan I get from Sorrisos. my favorite cheese is goat cheese!!! but i really love most cheeses, especially cheddar and brie! Toss up between Feta and Goat Cheese! definitely sharp cheddar cheese, preferably organic! but it certainly changes depending on time and circumstance. I'm currently enamored with Prima Donna. MMMM, drooling just thinking about it. Smoked gouda, brie, pepper jack, sharp aged cheddar. um ummm havarti. mmm deep fried havarti with warm grapes and honey. My favorite cheese is the Pleasant Ridge.